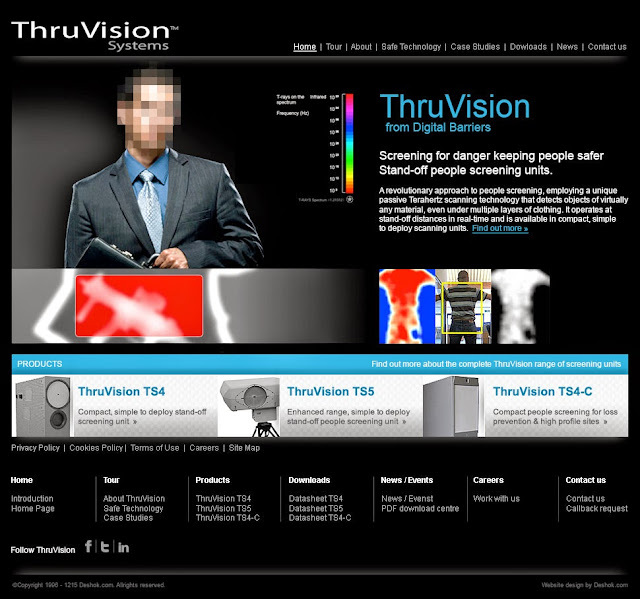 THRUVISION DIGITAL BARRIERS. SECURITY THROUGH INNOVATION. ThruVision are a technology company specialising in the design and manufacture of passive screening products for identifying person-borne threats in public areas. Increase lead generation and conversion rates through a comprehensive redesign of the website, brand and supporting marketing assets. 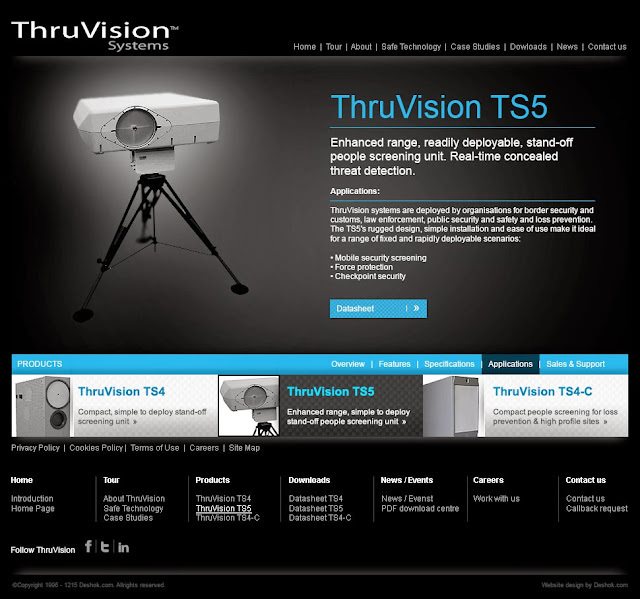 To communicate the ThruVision systems brand in a clear, concise and benefits-led manner; positioning ThruVision as an innovator and market leader in passive body screening solutions. Target organisations and government bodies included: Manufacturers, Corporate Entities, Law Enforcement, Aerospace and Defence, Customs and Homeland Security. Public concerns over personal privacy would also be addressed. The website design would convey the key brand qualities of technology, innovation, ease-of-use and security, through a clean and clear layout and navigation system. The use of our proprietary LiveUpdate text editing and content management system in key site areas would make updating site content straightforward for the ThruVision in-house teams or indeed anyone with Internet access and the login, anywhere in the world. One of the many key ideas suggested by the ThruVision marketing team was the introduction of a new ‘Tour’ section which was intended to help new visitors quickly understand what ThruVision could do for them and spring-board them further into the site to learn more. Every page header, along with the ThruVision branding and main navigation, would contain clean and clear contact details for ThruVision as well a link to the Contact us page. The products section would initially feature the three main products (TS3, TS4 and TS5) with the option to easily expand for future product releases. Flash banner introduction with feature panels linking to the main site pages. Company values, experience and mission statement. Privacy issues addressed with Big Brother Watch information. Overview of PDF case studies with links through to the Downloads area. An introduction to the three products with links to find out more. Product overview, featuring: example images, technical specs and links to PDF product sheets in the Downloads area. This would include a list of all available PDF downloads with links to instantly download. This area and all following would be content management enabled so ThruVision could update any PDFs as required. Latest news and events list with links to download more information in PDF format. 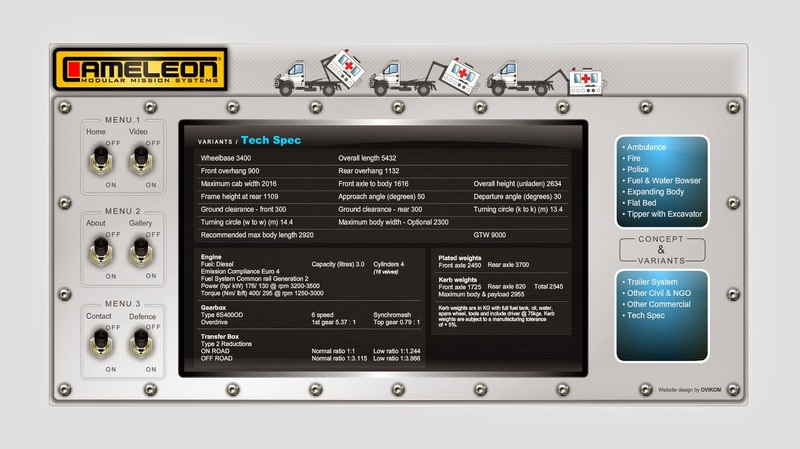 Area enabled with content management so ThruVision can add/update any News/Events PDFs as required. Equal opportunities statement and list of current positions. Current positions then link through to details of the position and information of how to apply this area would also be enabled with CMS so ThruVision could add/update any positions as required. Enter name, e-mail and tel number and press submit. Details of the request would be immediately e-mailed to ThruVision for actioning. If out of normal office hours the user is advised their call-back will be during the next working day. Call-back requests to be stored in the ThruVision Marketing Database. As well as the content managed areas as described above, all website text to be edited via our exclusive LiveUpdate technology, enabling instant text edits (and translations*) to be made via a standard web browser. Using the LiveUpdate technology would enable the creation of quick and low-cost local language versions of the entire website for foreign language markets and ThruVision would be able to do this in-house! All web visitor activity to be tracked via the Industry-standard Google Analytics which provides a wealth of visitor reporting and site usage metrics via Google’s Analytics web interface. All website pages to be search engine optimised with Title, Description, and Meta Tags to enable faster and more accurate indexing by search engines such as Google. An XML sitemap was created and submitted to Google to improve the indexing of the website. In addition to the standard footer links on all webpages, Social Sharing tools to be included, enabling visitors to easily share the page they were viewing with colleagues via E-mail, LinkedIn, Facebook and Twitter etc. A development plan and timeline was requested by the client, so we put together an easy to understand Schedule of Works detailing the proposed 10 week time frame and what would done by when. All call-back requests and e-mail signups to be stored in an online database, hosted within the website, which can be accessed via a secure web interface allowing downloads of all data at any time by authorised users at ThruVision. This area will not be publicly available. Redesign/update the existing brand/logo and develop digital versions of the logo for use online, in documents/presentations, as well as high-res print-ready versions for litho printing and a vector version suitable for sign making. 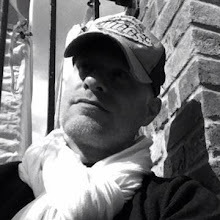 With extensive experience in marketing and developing digital campaigns over almost two decades and for a variety of clients including pan-European, multi-language websites for multinational companies, our methodologies are tried and tested, providing an engaging user experience, measurable performance and easy to maintain website content via our proprietary content management systems. All design, web development, artwork, video production and print management was undertaken by Deshok ensuring a consistent and cost-effective application of the brand throughout all channels. Refreshed brand and consistent approach to all marketing communications. Measurable results via management metrics. Constantly refreshed marketing database with opt-in e-mail addresses. Better search engine positioning via improved search engine optimisation. Benefit-driven approach to selling the solutions. Rapid and low cost setup of local market versions of the website helping to develop new territories or support existing territories/agents. Regular communications out to prospects/clients via the e-newsletters. 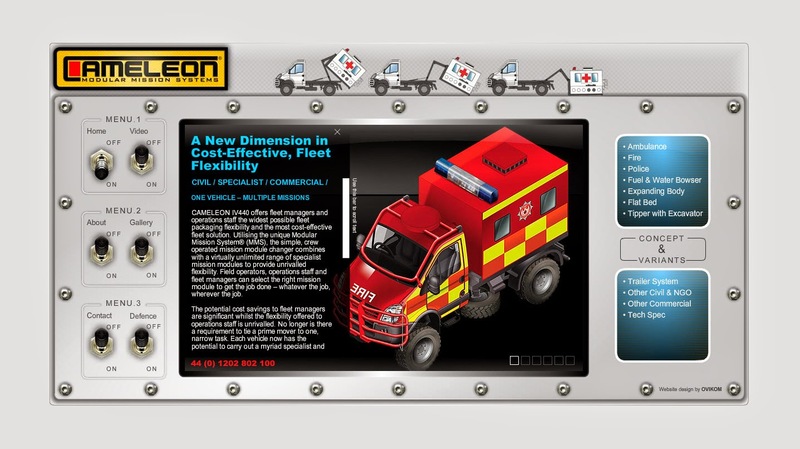 Flash animations can be used in offline sales materials including exhibitions. This project was for a company that Deshok already had a great working relationship with. They liked our style and we knew what they liked, so for this project it was a case of "You know what we like, get on with it!" This was to be a website for a brand new multifunctional vehicle for military use and later a civilian version would be introduced. The completely unique feature of this vehicle was its interchangeable pods. Thunderbird inspired, in less than 2 minutes one pod could be removed and replaced with another. This gave one vehicle the ability to serve a multitude of functions ranging from Troop carrier to Mortar Mission, Command centre or Fuel bower. Required was a logo/brand that was robust and which would work for a commercial as well as a military vehicle. The client was not too concerned if it was presented in a subdued colour way, but it would be an advantage if this was an option. So how was this done? Firstly a customised version of Gunship font was made and used for the main logo type. Other modifications were inspired by the client who wanted the aperture of the cap "C" to be extended, encompassing the logo type and leading the eye to the company strap line: "Modular Mission Systems". This logo was designed from the ground up with a strong positive silhouette. This basically means; black on white or in this case, black on yellow. This could easily be imagined as black on kaki or olive or grey etc. Other requirements were that the logo would work well on a pressed aluminium vehicle, barge, die-cut stickers and embroidery! The new Cameleon logo/brand was presented to the client in all its colour ways and all popular formats, it was also provided as a layered Photoshop document, 300dpi ready for litho printing. The most important was the 72dpi .png version with transparent backgrounds, for use on the website. 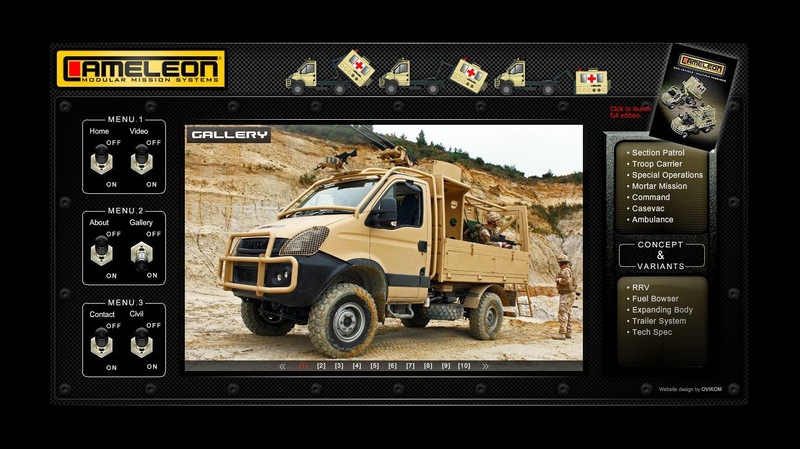 The challenge for this website interface was that it required one design for the two themes; Defence and Civilian. We also needed to be able to modify the colour ways so as to be appropriate for both markets, with minimal cost. We wanted it to look like an instrument you might find on the dashboard of a military or emergency vehicle and we wanted it to look tough and bulletproof; cue an over-engineered satnav made from carbon fibre, laminated to stainless steel and secured with hex-head bolts. 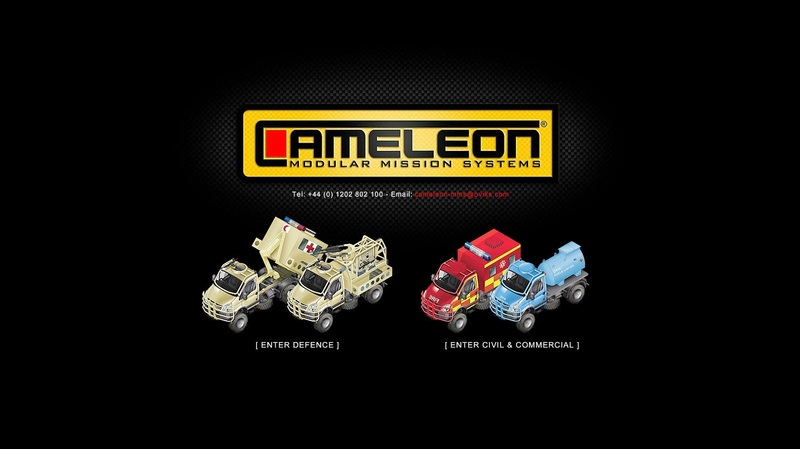 On initially opening the site the visitor is presented with the Cameleon splash page and the options of entering Defence or Civil & Commercial. They are then taken through to the home page. The key feature here is that when opening the site, it was required that the corporate video launched right away. This created some challenges for us, as the video needed to walk a fine line between being of the highest audio and visual quality, whilst uploading as seamlessly as possible. The video player has a neutral skin so as to work on both sites. 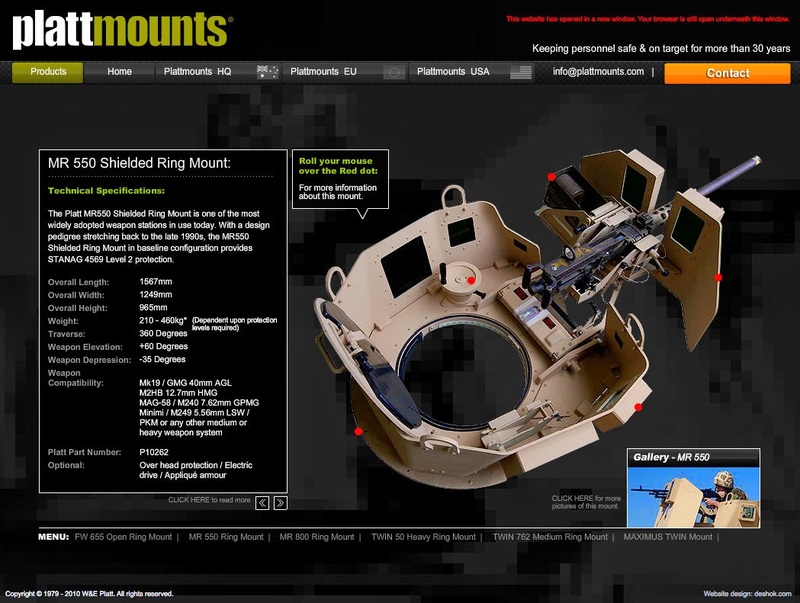 The whole interface surrounds the video and content aperture in the middle. This is also where the website content is presented. (we had a lot of fun with this). To the right of the interface are the Concept & Variants categories with information being presented in the main space. 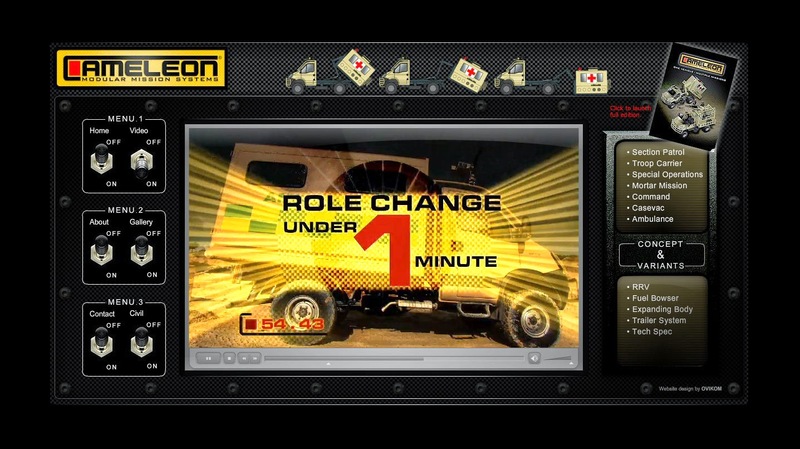 Here the visitor can find out all the information they need to make an informed decision about this vehicle and where appropriate, have an animated transition on load-up. Deshok was asked to create these assets for use in a larger campaign being managed by the client, so this time specific data was not made available. 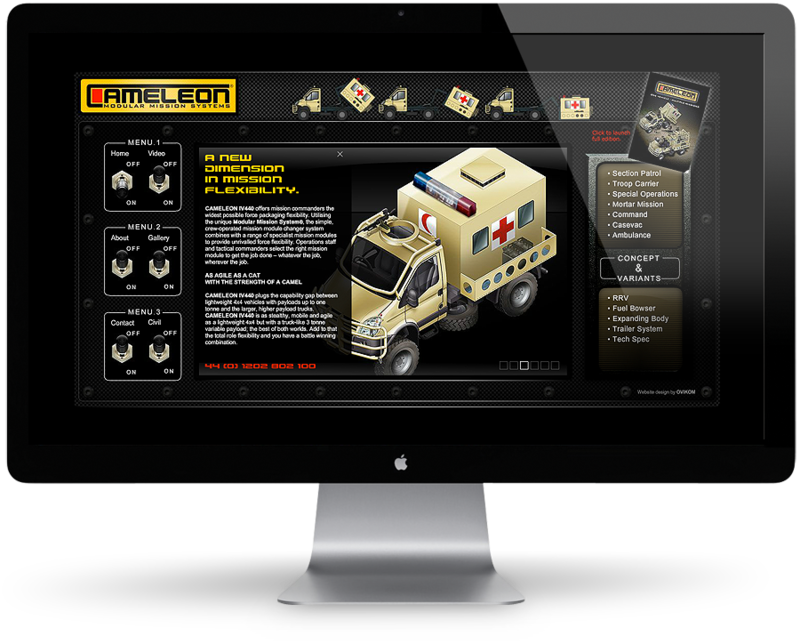 For Deshok it was all about attention to detail; it only seemed right that as much time and care should go into the website and logo design as went into the creation of the Cameleon itself. In this case, as with others, Deshok was proud to be asked to be part of this project and happy to go the extra mile. 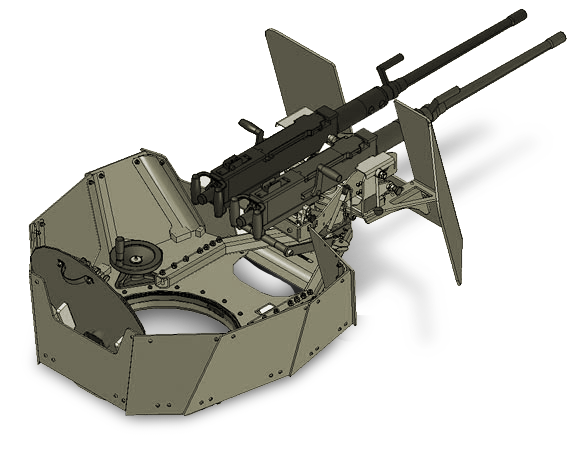 Established more than 30 years ago Australian company W&E Platt started on the road to building the best vehicle based gun-mounts in the world. 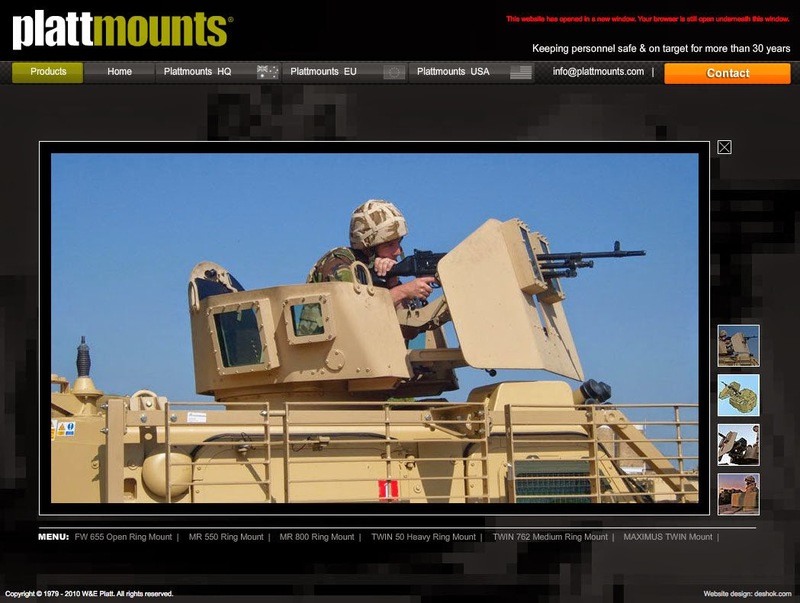 From humble beginnings and the original swing-mount, Plattmounts have gone on to be used by armed forces all over the world on vehicles such as the RG-31, Stryker, MRAP, LAV, HMMWV and other platforms such as the British army’s BvS10 VIKING, VECTOR BULLDOG and the TERRIER. 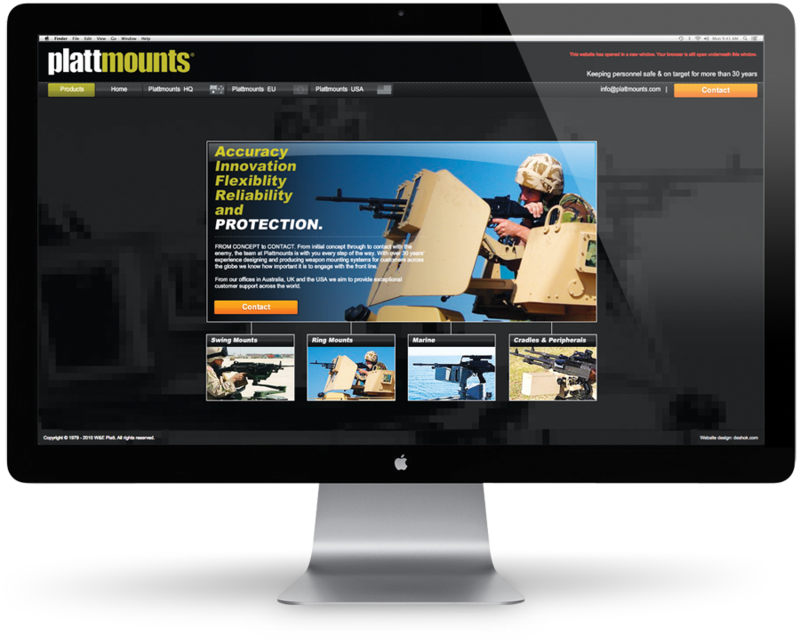 A company with such a long heritage and international footprint, needed a brand new website that would establish it on the internet with all the integrity it had earned in theatres of combat worldwide. The goals here were to create a website with the gravitas a company with 30 years of history under its belt deserved and that visitors would expect. 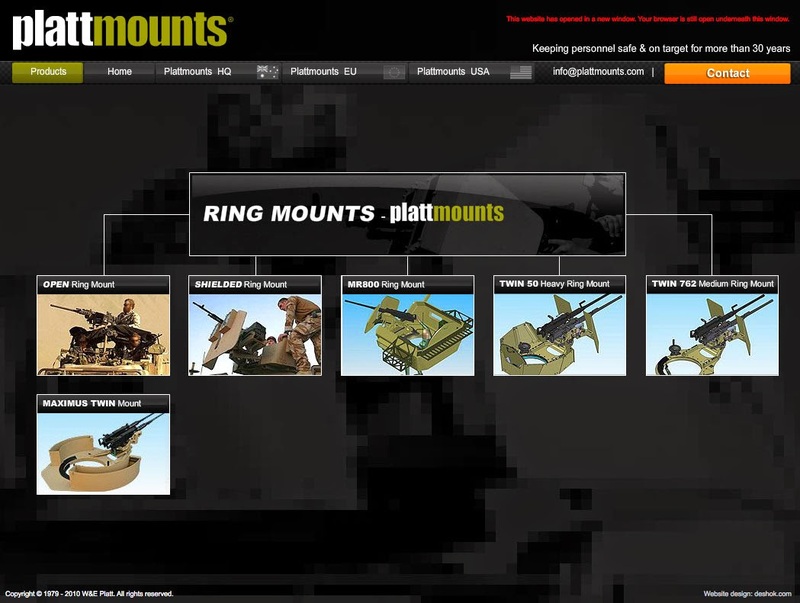 The new website needed to exhibit the growing range of Swing and Ring mounts, Marine mounts, Weapons systems cradles and Product peripherals, indeed the entire Plattmounts range. The new site also needed to introduce the visitor to Plattmounts offices in Europe, America and the HQ in Australia. We decided to build a F/S (Fullscreen) enabled interface for this website. This means that regardless of the size of the computer screen, the website would fill the whole thing. The menu was deliberately simple and designed not distract from the content too much, but with colours that became obvious once rolled over and of course each menu item was clearly labelled. The website was designed to look robust, using custom carbon fibre texture for the backgrounds of the menu and other features on the site. Subdued colours were used throughout and a strict, simple pallet of graphite, gunmetal and carbon was followed. The exception to these colour rules was the Contact Us button, situated to the right of the screen in a bright emergency orange. Another exception to the pallet was the all important Products button, situated to the left and differentiated in olive green. The home page features a clear mission statement so the visitor can decide if they have come to the right place right from the home page. The four main product categories were also featured on the home page so at a glance the visitor can see where to go. Product pages feature an animated hero shot and once loaded offers the visitor the option of rolling over key features of the product to flag up detailed snippets of information. Each product page also includes a gallery with stills of the product in action etc. Many of these were provided by Plattmounts clients and agents. A secondary menu including all the products in the chosen range runs along the foot of the product pages, this allows the visitor to easily navigate all the products in a category without having to reopen the main products / category menu. Although the website was developed for a serious subject, it was designed to have a computer game, Sci-Fi, OO7 agent feel. 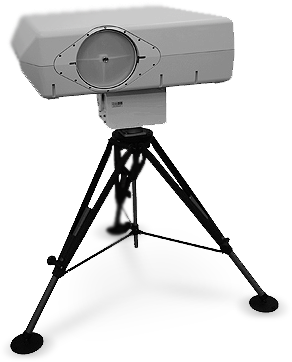 This is to help it stand out against competition and other defence based companies. 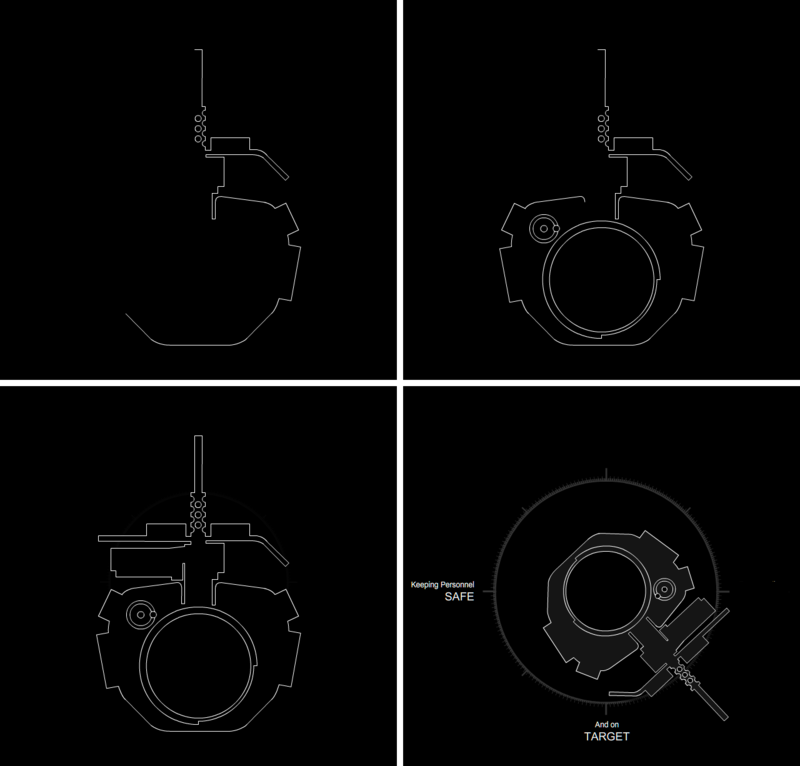 An animated introduction was designed and produced in-house to help demonstrate to the uninitiated what a Plattmount was and it's 360 degrees of benefits. For this the strap-line "Keeping personnel safe and on target" was conceived. Each of the worldwide Plattmount agents were given a dedicated section including General Introduction, Contact Information pages and their own galley for which they were invited to submit photographs for inclusion. This was a nice touch and helped agents in far flung parts of the world feel that they were part of the wider Plattmount family. 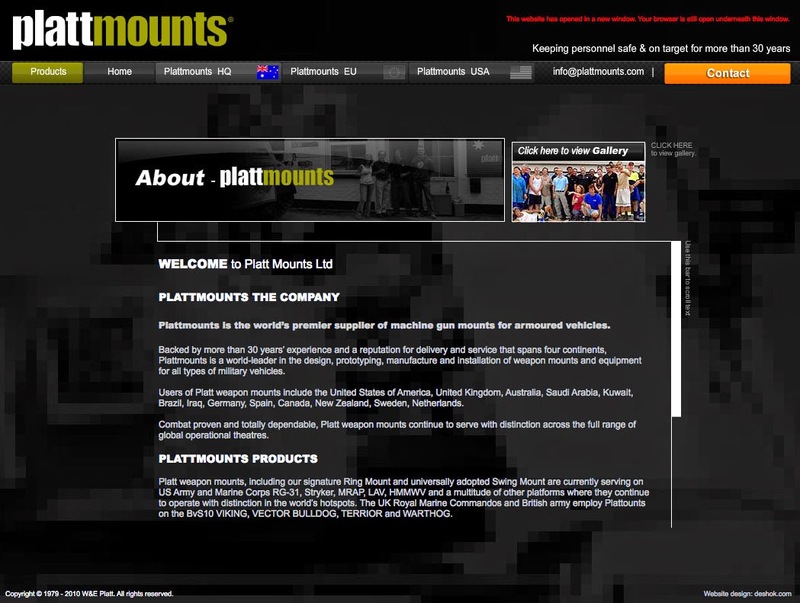 The very first incarnation of this site was actually built for the UK and European territories, but Plattmount worldwide liked it so much that it was rolled out replacing their existing presentation in both the US and Australia.